Newly renovated, charming and characterful chalet-hotel in the centre of Chamonix and just 2 minutes from the nursery slopes at Brevant. The hotel offers excellent value accommodation in the centre of one of France's most vibrant mountain towns. Guests have a wonderful sun terrace that looks out over Mont Blanc and affords spectacular views of the mountains and Aguille Midi. Downstairs has a very atmospheric boutique-bar and brasserie which is open to the public for food, drink and happy hour.It is a very central hotel, located just a stone's throw from the slopes & lifts which access the Brevent-Flegere ski area. In fact the slopes are less than 2 mins walk away! It is a rare thing indeed for a chalet-hotel in Chamonix to be located so close to the ski slopes. With a stay at Hôtel Le Gai Soleil in Samoens, you'll be in a shopping district, within a 10-minute walk of Jaysinia Alpine Botanical Gardens and Samoens Ski Resort. 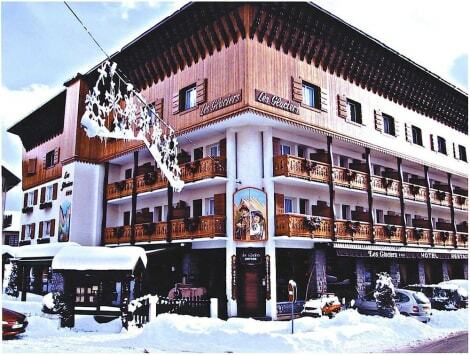 This ski hotel is 0.8 mi (1.2 km) from Grand Massif Express Gondola and 0.9 mi (1.5 km) from Base de Loisir des Lacs Aux Dames. Enjoy the convenience of ski-in/ski-out access at this hotel, which also features a health club and an outdoor pool. Additional features at this hotel include complimentary wireless Internet access, ski storage, and tour/ticket assistance. A major winter sports destination, Samoens is renowned for its striking mountain scenery and is one of France's most attractive settlements. The commune, which is very close to the Swiss border, was originally a centre for limestone quarrying but is now among the most popular family friendly skiing destinations in the French Alps. Another very popular activity in this area is snow-shoeing, which takes place on several summits such as the Pointe de la Golese, Le Bourgeoise, and the Le Parteset, and can often be arranged in organised groups. See this remarkable botanical garden, which marked its centenary in 2006 and features thousands of plants from locations all over the world. The garden also contains a special collection of alpine flowers, and is generally only closed to the public when there is snow cover. Although this city is known for being the headquarters of many international organisations, Geneva is also a flourishing cultural hub and the home of the enormous Jet d'Eau fountain. Wander around the magnificent Musée Ariana, which is housed in a splendid Neobaroque and Gothic Revival building and exhibits thousands of artefacts dating back to the early Middle Ages. The Musée d'Art et d'Histoire, meanwhile, is housed in a stunning building designed by the renowned architect Marc Camoletti, and showcases the work of many esteemed local and international artists and art icons over the centuries. Next to the emerald waters of Lake Annecy, Annecy is a delightful French city that is famed for its annual Annecy International Animated Film Festival. Spend some time along the Thiou waterfront, which has been nicknamed the 'Venice of the Alps' and is surrounded by plenty of stylish cafés and restaurants. Another majestic landmark here is the Château d'Annecy, an official 'monument historique' that dates back to the 12th century and is the location of the Museum of Alpine Popular Art. If you're after some delecSEOSITE_LEVEL_DESCRIPTION French dishes, try dining at La luge restaurant, or enjoy some delicious Italian food and hamburgers at Alti Pizz. For other mouthwatering international and fusion-themed dishes, head to Le Monde a L'Envers, or choose the Restaurant Mezzanine for some other scrumptious Mediterranean recipes. One of the most reputed Samoens hotels is the Hotel Neige Et Roc, which, like most accommodation establishments in the area, benefits from wonderful mountain views and elegant furnishings. Other hotels you might want to consider include Le Berouze and the Hotel Residence Gai Soleil.